These are the items I am in the process of listing on Etsy. I have a lot more -- the more I list, the more I find to list. 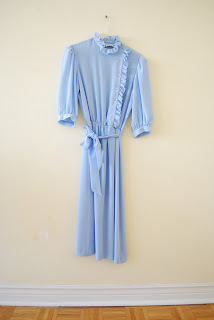 The pale blue ruffle dress? I found the same one today in fuchsia. Crazy. I'm saving a huge pile of clothing for the rummage sale, but I thought I'd try my luck online too. If you're in Toronto, come by the Workroom on April 19 for the Hunt & Gather trunk & rummage sale! I've gathered some lovely things. Please say hello! When I hunt for vintage, I scan the racks by looking for for colour and texture. So while some of these pieces are polyester (it's so hard to avoid polyester), they're always lightweight and breezy poly. I love these pieces. These are items I wish I could keep for myself. I would wear each and every one!